Open Text Corp. today announced that it was acquiring Montreal-based text mining and publishing solutions vendor Nstein Technologies for CDN $0.65 per share, or CDN $35M, equivalent to US $33.5M, a 100% premium over the trailing 30-day average closing price of Nstein’s common shares which are traded publicly on the Toronto Stock Venture Exchange (TSXV). In its most recently reported financial period, 3Q09, Nstein reported (all figures CDN) $4.6M in revenues, and -$0.8M in EBITDA. Revenue was down 24% on a sequential basis and 17% on a year-over-year basis. Given the $18.4M run-rate and the $24.2M in TTM revenues, Open Text paid 1.9x run-rate and 1.4x TTM revenues for the small, largely text-mining focused concern. While the 100% premium is surely good news for shareholders, it’s off a valuation that is less than 1x TTM revenues (0.72x to be precise). Then again, the company was both losing money and shrinking. 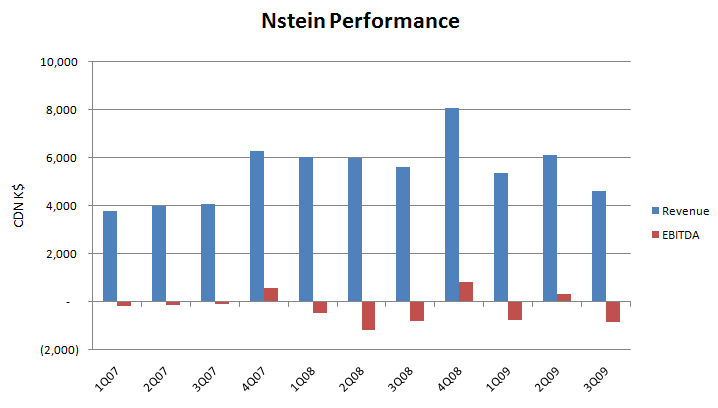 I’ve charted 11 quarters of Nstein history above, which makes the picture pretty clear. Even the 2/08 acquisition of Picdar couldn’t get growth going, organic or otherwise. In terms of focus, Nstein’s roots were in text mining. The Eurocortex acquisition brought them a poor man’s CMS, with Nstein paying less for a company than large Documentum customers pay for a license. Picdar brought them digital asset management. So you had a company doing $4.6M a quarter split across three areas: text mining, CMS, and DAM. Given the abnormally low 52% gross margins, that means a whole lot of that revenue was services, so they were maybe doing $2M a quarter in license. That’s $0.7M in license for each of the three areas, which basically rounds down to nothing. Remember the expression: if you try to be all things to all people you can end up nothing to everyone. This appears to be yet another example. To my knowledge, this focus splitting was done in the name of “solutions” though what the company was known for — to the extent it was known at all — was text mining. I’ve previously blogged on such solutions strategies, and Nstein’s in particular: NStein 2Q08, Growth Slows: The Moldy Sandwich. The tension highlighted in the “moldy sandwich” argument is that between creating a truly best-of-breed component (e.g., a sentiment analysis engine) and offering customers complete solutions to problems. Companies are invariably pulled by their salesforces to the latter, while most companies can only credibly offer the former. Simply put: do you want to offer your customers either great ham, great cheese, or great mayo — and ask them to build the sandwich — or do you want to offer them a complete sandwich, but made from bad ingredients? For most technology companies, I’d say you’re kidding yourself if you can think you can do both. While I’ve never been a fan of the moldy sandwich strategy, I both know and like several of the folks at Nstein, and want to offer my congratulations to them on this deal. While I’m guessing the CMS will go away and the DAM customers will be moved to Artesia, I’m reasonably sure that they have found a nice home for the text mining engine and gotten a reasonable valuation for the firm (given its trajectory) and a nice pop for shareholders in the process. This entry was posted in Strategy, text analytics, Uncategorized. Bookmark the permalink. Note that I’ve heard from a friend at Nstein that there are no plans to move the DAM customers to Artesia. So it’s still speculation on my part — on verra.